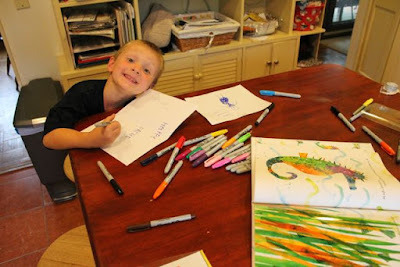 Last Friday night, I sat down with our stack of Eric Carle picture books. My wife came into the room after getting our youngest daughter to fall asleep and do you know what she did? 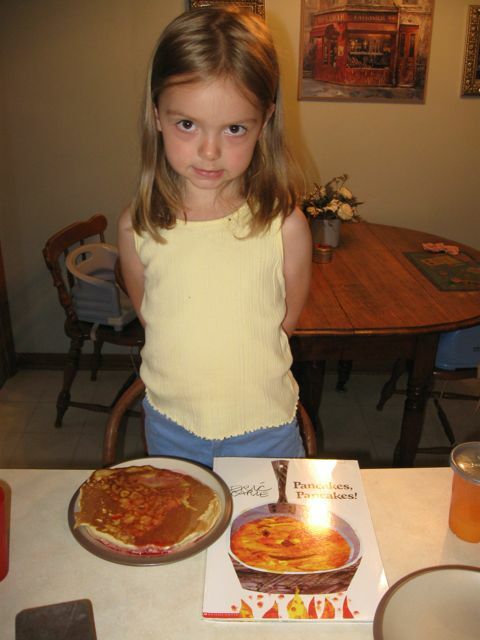 I said, "Are you making fun of the way I like to spend my Friday nights?" She insisted that she wasn't laughing at me, but was just surprised to see me surrounded by books while sitting in a pink bean bag chair. Either way, it's all good. 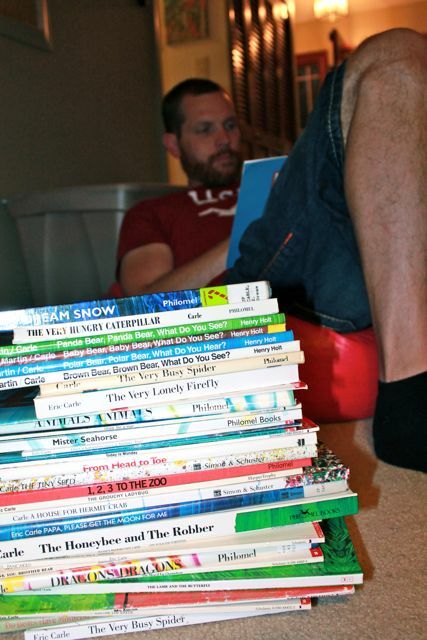 I am perfectly comfortable saying, reading a pile of picture books is great way to spend an evening. I wanted to celebrate Eric Carle's birthday with my children again this year and I thought the only way to come up with an idea was to start with the first book in the stack and read as many as I could until I had an activity idea. As I read I separated the books into piles as I read; books with a potential birthday celebration activity idea (Mister Seahorse, Papa, Please Get the Moon For Me, and My Apron), books I wanted to read to my kids this week (Draw Me a Star, Pancakes, Pancakes, and "Slowly, Slowly, Slowly," Said the Sloth), and then a pile of all the rest of the books. 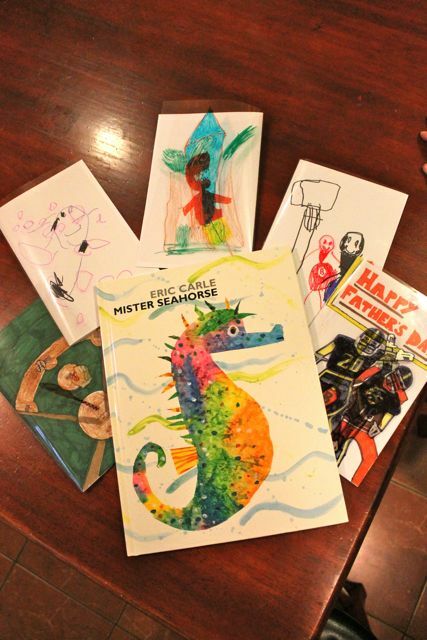 Mister Seahorse and Papa, Please Get the Moon For Me caught my attention because Father's Day was just two days away. Both of these books feature fathers; Mister Seahorse carries eggs in his pouch and meets many other father-fish who also have important responsibilities in raising their young and Papa, Please Get the Moon For Me is a story about a father who goes to great lengths to fulfill his daughter's wish. 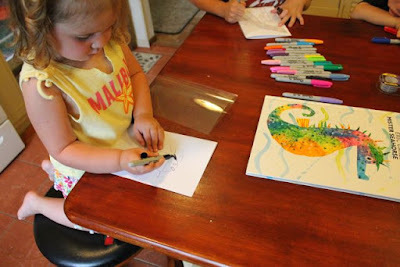 In fact, Eric Carle wrote Papa, Please Get the Moon For Me for his own daughter, Cirsten. (Jacketflap Papa, Please Get the Moon For Me). In Mister Seahorse there are four "peek-a-boo" pages; clear pages with illustrations that hide part of the illustration on the next page. 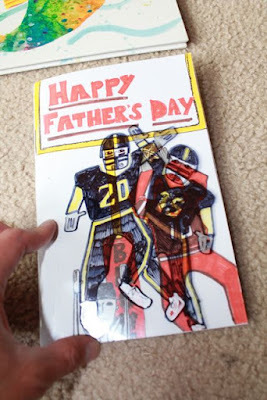 I thought it would be fun to incorporate "peek-a-boo" pages into Father's Day cards, not for me, but for my dad who we would be seeing on Father's Day. 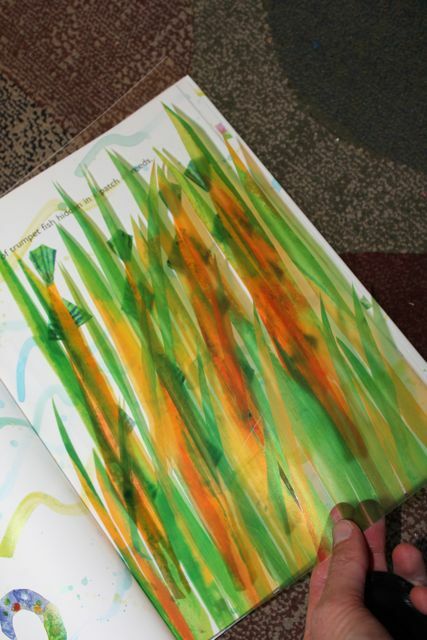 This "peek-a-boo" page has an illustration of a patch of reeds which hides a group of trumpet fish on the next page. We read Mister Seahorse and talked how about how the "peek-a-boo" pages allowed Eric Carle to hide things on the next page. 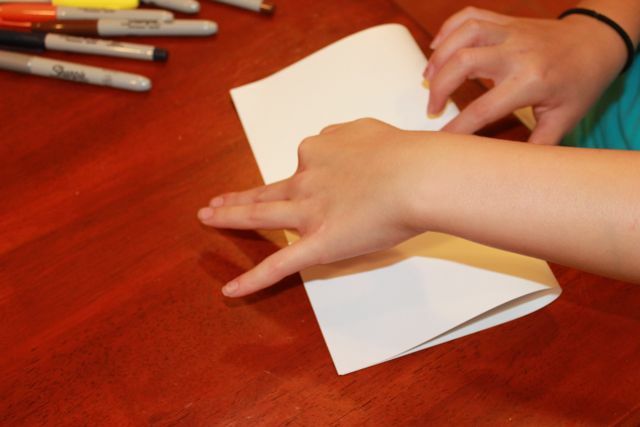 We folded a piece of white card stock paper in half. 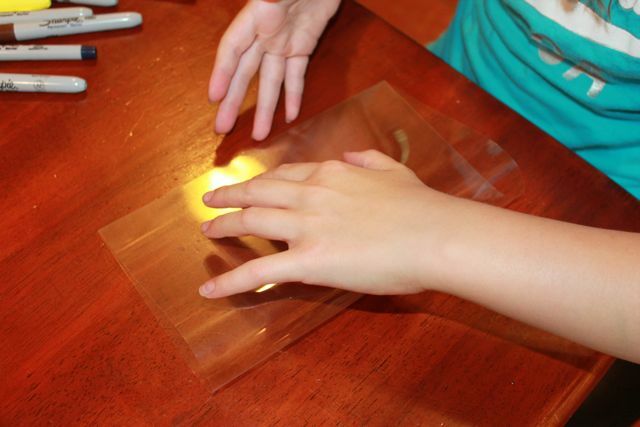 Then, we folded a piece of clear transparency film in half. 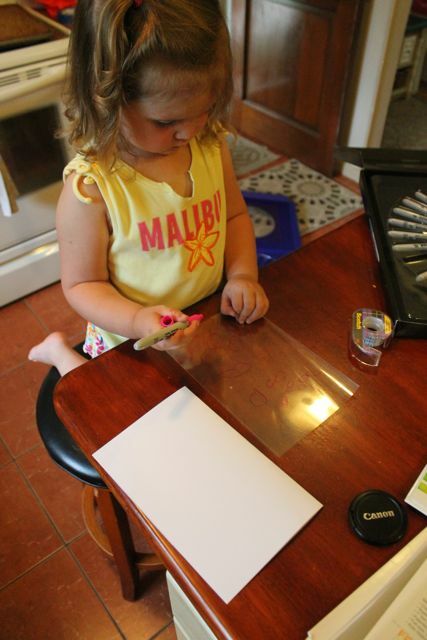 We used permanent Sharpie Markers to draw on the clear transparency film. My daughter started by drawing pink leaves. Then, she drew a seahorse on the white paper. My oldest son drew trees and a house that hid a dinosaur. My son drew Lebron James playing basketball against the Chicago Bulls on his card. Then, he wrote "Happy Father's Day" in his best handwriting on the inside. 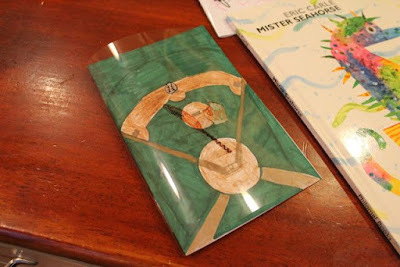 My oldest daughter drew a baseball bat, ball, and glove on the "peek-a-boo" page which laid on top of a baseball field. 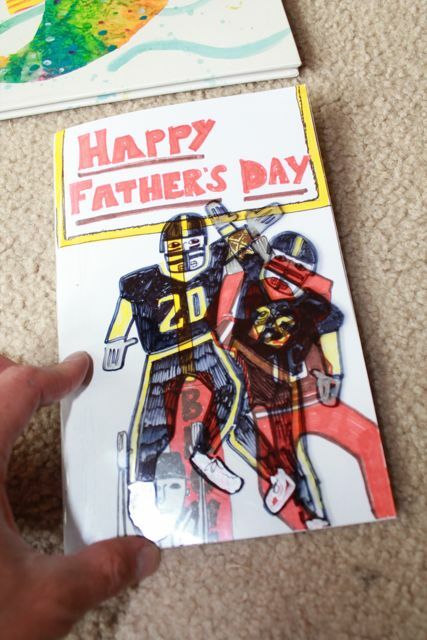 She worked really hard on this cool card! My dad loves the Cleveland Browns. 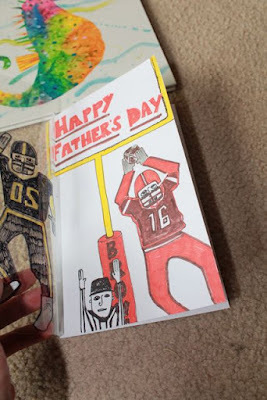 I drew two Pittsburgh Steelers defenders on the "peek-a-boo" page. 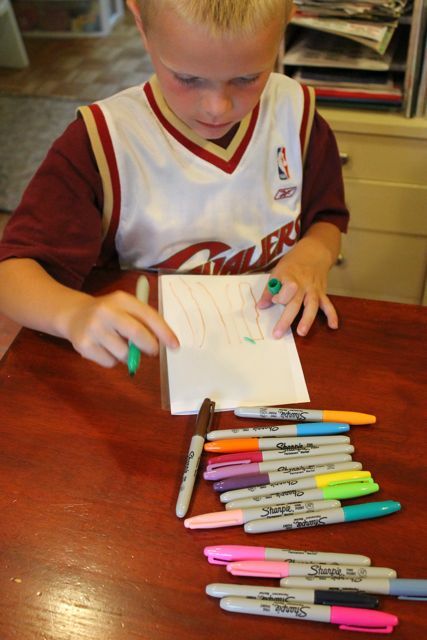 On the white paper it is revealed that the Cleveland Browns receiver caught the football for a Touchdown! Note: We taped the back of the white paper to the clear transparency film to hold the two pieces together. 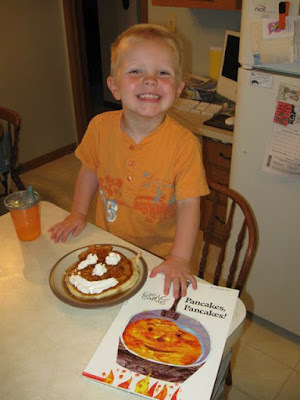 Our first birthday celebration for Eric Carle, five years ago, featured Pancakes, Pancakes (and a smaller stack of books). This year, my youngest daughter woke up asking for pancakes just like Jack in the book. We read the book and made pancakes together for breakfast. 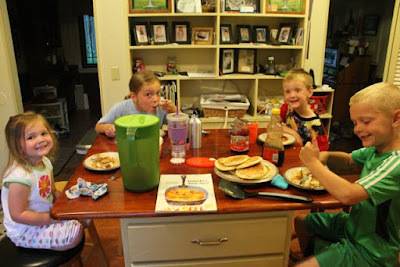 This year's Pancakes, Pancakes breakfast had four children! Five years ago, we only had two kiddos eating pancakes!! Do you have a stack of books by Eric Carle? What favorite books would you place on the top of your pile? I hope everyone enjoys this fun day of reading with their little ones! 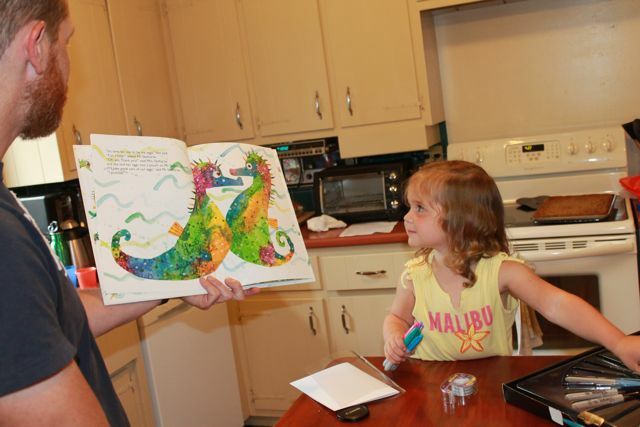 Happy Birthday, Eric Carle!